This month’s We Should Cocoa is all about eggs. Lindsey over at Lancashire Food is hosting and given that Easter falls in March this year, she thought eggs were an apt theme. Of course they are. There are various theories about the origins of Easter. Some say it’s from the Babylonian goddess of procreation, Ishtar, some the pagan and/ or Saxon goddess of fertility, Oestre. Then of course there is Pesach, the Jewish Passover and we mustn’t forget the death and resurrection of Jesus Christ. Whether you’re Pagan, Jewish, Christian or of some other persuasion, there’s no doubt that Easter is a celebration of new life and the eggs that abound at this time of year are a fitting representation. I wanted my Easter chocolate cakes to acknowledge some of the spices and flavours associated with Easter, specifically hot cross buns. I used my hot choc buns for inspiration and included raisins, allspice, cinnamon, nutmeg & orange, but with a cheeky little addition of rum. Duck eggs were included in the recipe and mini chocolate eggs of various kinds were used to decorate the finished cakes. I particularly like the crack appearing in the yellow egg on the left hand side of the picture above – perhaps a chick is just about to emerge. For even more Easter recipe inspiration, you might want to take a look at my Easter board on Pinterest. 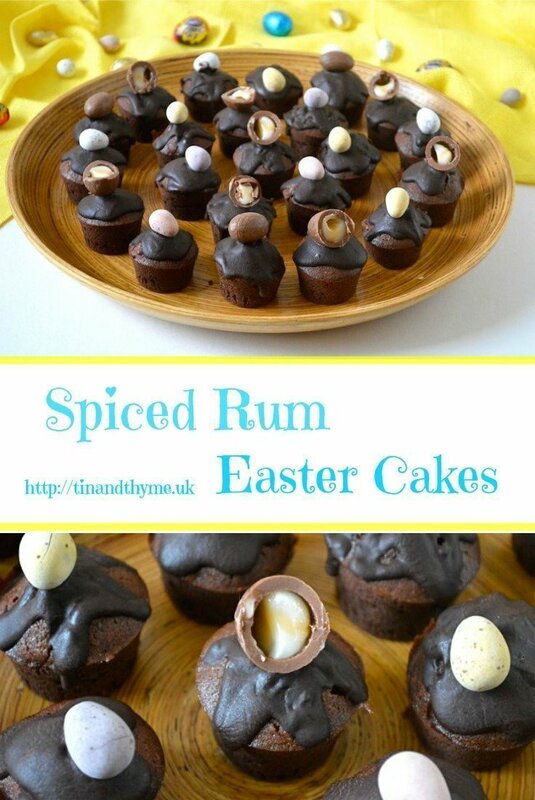 Mini Spice Rum Easter Cakes. PIN IT. Thanks for visiting Tin and Thyme. If you make these mini spiced rum n raisin Easter chocolate cakes, I’d love to hear about it in the comments below or via social media. Do share photos on your preferred social media site and use the hashtag #tinandthyme, so I can spot them. For more delicious and nutritious recipes, follow me on Twitter, Facebook, Instagram or Pinterest. Mini chocolate cakes subtly flavoured with Easter spices and a little orange. The rum soaked raisins are less subtle, but give a surprise heady hit. They are topped with a chocolate rum glaze. 24 mini chocolate eggs to decorate or 12 mini creme eggs - halved. Place the raisins in a covered jar and add the rum. Leave to soak for as long as possible (24hrs or more is best). Beat in the eggs, one by one, adding a little of the flour to prevent curdling if necessary. Sift in the flours, baking powder and spices and stir gently to combine. Gently stir in the rum and raisins. Divide the mixture between 48 mini silicone muffin moulds or tins lined with cases. Bake in the middle of the oven at 180℃ for 15-20 minutes until the cakes are well risen and firm to the touch. Allow to cool in the moulds for a couple of minutes, then turn out onto a rack to cool completely. Melt the chocolate together with the rum gently in a bowl over hot water. Stir until combined, then add the butter. Remove from the heat and stir until you have a shiny glaze. Spoon over the top of the cakes and allow to run down the sides. Top each with a mini Easter egg or halved mini creme egg, then leave to set. Best if raisins are soaked for 24 hours or more. Makes 24 mini cakes or 12 cupcakes. As mentioned above, We Should Cocoa is being hosted over at Lancashire Food this month and the theme is eggs. Simply Eggcellent over at Belleau Kitchen is also celebrating Easter eggs this month. It’s all about Easter over at Tea Time Treats with The Hedge Comber and Lavender and Lovage. I’m also sending my Easter chocolate cakes to Treat Petite with Baking Explorer and Cakeyboi where the theme is also Easter. And last but by no means least, these Easter chocolate cakes go to Maison Cupcake and Casa Costello for Bake of the Week. My husband loves rum and chocolate cake, so this sounds like something he wouldn’t be able to resist. Thanks Katie. Spiced bakes have the added benefit of making the house smell wonderful whilst they’re baking. They look lovely ! I am not a fan of fiddly decorations, but this is just right. Not sure whether I am going to make them though. The list of things I’d like to make for Easter is already too long. But we’ll see (I am sure they taste good !) Still no duck eggs to be found here, but now and then goose eggs are on offer and these are great for baking too. Oh yes goose eggs are wonderful. It must be coming up to goose egg season now. Mind you, you need to be making a big cake if you’re going to use one. Oh. Now. These look more than a bit moreish! I think I would be hamsters like Dom! Oh Chris, you never would, you are far too refined. Thanks Linzi, glad you could see it too. Thanks Helen. These cakes are not for the faint hearted, but they really are delicious. Oh I’m a spiced rum girl — these are calling my name! Haha Sue. I don’t do much in the way of drinking alcohol, but I do like to bake with it. Loving a cheeky bit of rum at Easter time! The cakes look adorable, thank you for entering them into Treat Petite. Great idea, Somanz things in one morish cake! These look so adorable and perfect Easter treats to serve and gift. Those little cakes are so cute and with rum and chocolate they are getting my attention!! Thanks Heidi. One of the many wonderful things about chocolate is that it pairs well with so many flavours. Chocolate and rum is such a lovely combo – I like a tot in my hot chocolate! Haha, do you indeed CC. I think I might just have to try that. Food of the gods indeed! I would love to throw some rum at my cakes, but I fear Miss GF may just leave home as a consequence….. If I wasn’t gluten free I would have some of these sent over immediately! They look so cute and sound ultra delicious Choclette! What a gorgeous combination, rum and chocolate! Love these little bites, just enough to satisfy a sweet tooth. I’m a big fan of mini cakes, If only I could stop at one though. Haha, there’s a lot to be said for eating with our eyes only. I’d be bigger than my house if I tucked into everything that tempts me on blogs. These look incredibly more-ish! Thanks for joining in with #BAKEoftheWEEK ! My mind is always on chocolate! And these are so cute! These look so delicious and incorporating hot cross bun spices, absolutely genius idea. I would have to leave out the orange (allergic) but would love to try these. Love their biddy size, perfect for munching more than one . Happy Easter to you. Thanks Sammie. I’m a big fan of mini cakes, probably so I don’t feel greedy having a second one 😉 I just heard of someone else who was allergic to citrus – how very annoying for you.